I love drinking wine ! Wine can really be a great addition to any meal or just sipping wine after a hard days work ! That's why I really like Winc wines delivery service! I just signed up at their website #ad www.trywinc.com/usfamilyguide @usfg completed a 6 question palate profile quiz and from the quiz they will pick 4 wines for you. 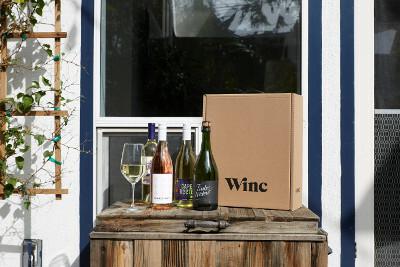 Then Winc wines will ship you 4 different wines every month. You can also pick your wines or skip a month, it's a 12 month subscription . And wines start as low as $13 a bottle . I picked Compartes sparkling wine it's sweet with a slight fruity taste , it was delicious and it's from California and it also came with a yummy dark chocolate vanilla salt bar ! Then I picked One from the quiver Torrontes from Argentina , It has a dry but fruity taste . drinking it was like being on vacation in Argentina ! Then I picked the 2016 rose wine from California it has a fruity taste and you can really taste the different fruit ! The last wine I picked was Porter and plot Sauvignon Blanc from California. It's dry with a fruity taste and you can taste the apple . All the wines I picked were delicious , you can keep them for yourself or use them as gifts!